What does books of the Bible mean? The books of the Bible refer to the various collections of sacred scripture comprising the Old and New Testaments in the Christian tradition. If the books of the Bible could vote, which would be most likely to cast a Republican ballot? A therapist who interviewed most of the surviving children from the Branch Davidian cult in Waco, Texas, said that one 5-year-old could recite whole books of the Bible but could not identify circles and squares. Never forget. There are five books of the Bible that are considered poetic. So, when people roll their eyes at the kind of books I've written, I always remind them that, if God appreciated poetry, perhaps everyone else should as well. Where does books of the Bible come from? The term books of the Bible comes from the fact that the Bible, sacred scriptures in Christianity and Judaism, is an anthology of many different books. The word Bible itself comes from the Ancient Greek for “book, paper, scroll.” The total collection of 66 books in the Christian tradition emerged over an estimated period of 1,400 years by 40 different authors originally writing in Hebrew, Greek, and Aramaic. They were later translated into Latin, English, and other languages, of course. 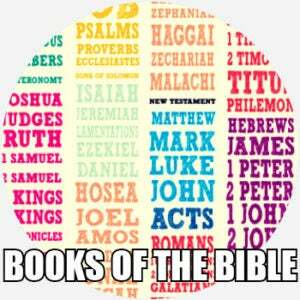 The Old Testament in Christianity is the first 39 books in most Christian bibles. It recounts stories of creation, the Garden of Eden, Abraham’s calling by God, Noah’s flood, Moses and the Ten Commandments, and the experience of the Jews as God’s chosen people. The books of the Old Testament, previously passed down orally through generations, are assumed to have been first written circa 1500-2000 BC, beginning with the Book of Job. By circa 300 BC, all the original Old Testament Hebrew books had been written, collected, and recognized as canonical. Some of the most famous parts of the Old Testament include Genesis, Exodus, Deuteronomy, Leviticus, Psalms, and Proverbs. Circa 45–100 AD, the original 27 books of the Greek New Testament had been written and collected in four major categories. The New Testament centers around Jesus, and some well-known books include the Gospels (Matthew, Mark, Luke, and John) and Revelations. They carry the overall message of Jesus Christ, son of the Christian god, coming into the world to provide salvation for all humanity through his crucifixion and resurrection. The various texts of the Bible went through a huge number of divisions, translations, and changes in accessibility until around 1381, when John Wycliffe began to compile and translate into English the entire Bible for general use. In 1455, Johannes Gutenberg created the first printed Bible in the Latin Vulgate. The most popular version of the Bible, the King James Version, was first published in 1611. Many other versions have emerged since then, but the King James authorized version remains the most printed book in the history of the world. There are many different biblical canons (that is which of books of the Bible are counted as official, sacred scripture) among different religious communities. The canons have developed through debate and selection from various authorities in different religious traditions. For instance, the Hebrew Bible, or Tanakh, includes the first five books of the Christian Old Testament, called the Torah. Protestants and Catholics have the New Testament, but the Protestant Old Testament (same as the Hebrew Bible, though organized slightly differently) has seven fewer books than the one recognized by Roman Catholics. Who uses books of the Bible? Quoting of specific books of the Bible is sometimes negatively associated with memorization as opposed to deeper understanding. Others challenge the appropriateness of rotely citing a centuries-old text in relation to contemporary issues of which the original writers and contributors could clearly not have foreseen. Interpretation of the books of the Bible, however, continues to evolve. Non-canonical books of the Bible, or those not officially sanctioned as scripture by the Protestant or Catholic Church, are referred to as apocryphal. The Gospel of Thomas is a notable example.